How do you prepare younger family members to manage their wealth well and flourish in their own lives and in the family enterprise? Every family is challenged to find creative ways to engage family members in the process of learning—about the family and what it values and owns, as well as what it takes to care for these human and financial assets. This report addresses the need for every family to prepare its next generation to manage their wealth well and participate in the family enterprise. 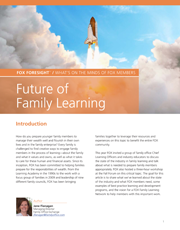 It summarizes what we have been learning—including best practice programs in learning and development—from the FOX community and our subject matter experts over the last year.